LA Day LA Night, Photographs by Michael Light. Radius Books, 2010. Hardbound. 72 pp., 34 duotone illustrations, 10-1/2x16". The Z binding of these two books is what grabs you first. These books are different. They are a contradiction. You can start in the daylight or the darkness, your choice. The textural qualities of the finely rendered black and white images draw you into the daylight. LA Night redefines film noir. Either time frame, you are not disappointed. This is a private view of LA, known only to birds, traffic reporters, police in helicopters and Michael Light. The fancy curtain of glamour is pulled back to show the working class backbone of the city. It is the gritty city-ness of the place where dreams and imaginations live. Highways, streets, railroads, the river, all snake through the photographs in the bright sun of LA Day. The day images focus on the sun and the shadow created below. 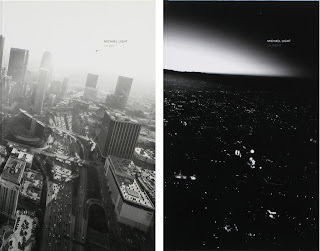 LA Day, LA Night, by Michael Light. Published by Radius Books, 2010. It is at night that the grid of the modern city is outlined for the viewer. In LA Night the blackness is outlined by lights on the streets, signs and buildings. Light's image of Downtown/Dusk shows how the lights create a different view of the city. It is more like an octopus glowing in the night; the day images show how the tentacles look stretched out, while the night images are overall shots of the whole beast. This is due to the technical limitations Light faced while photographing at night. He mixed traditional film and digital technologies to bring out the night highlights in seas of darkness. The city appears larger at night. The Jesus Saves image stands out, the sign pulsating like a beacon for those lost in the danger blackness of the city. In either book, one aspect that Los Angeles can not escape is the sheer number of cars that fill the frames. We see cars moving, or attempting to move along crowded roadways. Cars are lined up like toys in parking lots and garages. In some of the night images, lights stretch out in front of the car or glow in white dots marching in straight lines. At night light is like white paint dripped on black paper and the vast area feels laid out differently than the daylight images.